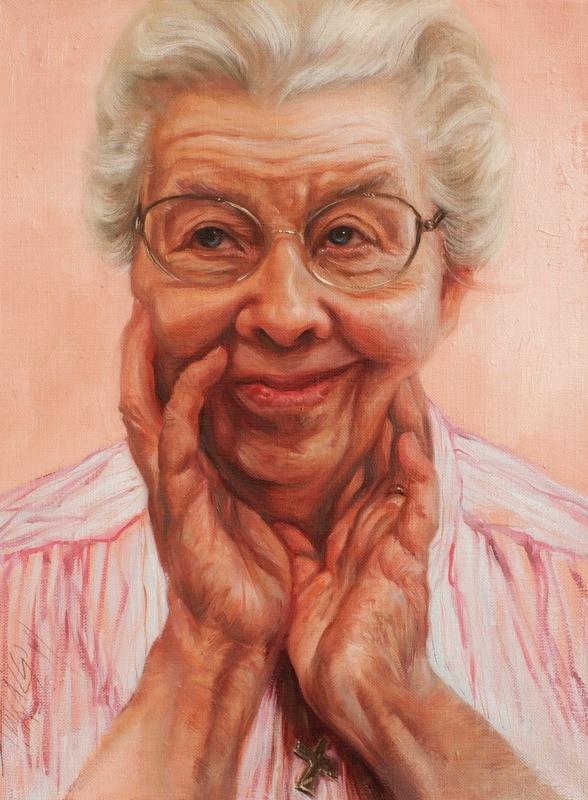 Just to mix things up a bit, in my Chicks furlough, I found myself in the enviable position of painting beautiful retired nuns. Just to be clear, none of these nuns posed for me for Chicks with Balls. Though, after hearing their stories, I saw just what an incredible group of unsung heroes these women are… within the Catholic Church, an institution that desperately needs them. The only reason I'm talking about painting the nuns here on the Chicks blog is to chronicle my art activities during my short inspiration break from Chicks with Balls. How did I get this gig? My mom hooked me up. You may know that my mom (a chick with balls herself) is a retired English Professor at Notre Dame College of Ohio. She is not a nun herself…she’s my mom remember…but she is friends with many retired nuns whom she taught with for many years at Notre Dame. The retirement center at Notre Dame is an incredibly welcoming place where the sisters continue their work, care for each other and are vital alive and active as they transition into old age where they need more care. Such a wonderful model for assisted living, these senior women are friends, and continue to be extremely useful to the world and each other for their whole lives. I was welcomed to a wonderful warm female nest of work, satisfaction, love, prayer and complete confidence that the next stop was heaven. 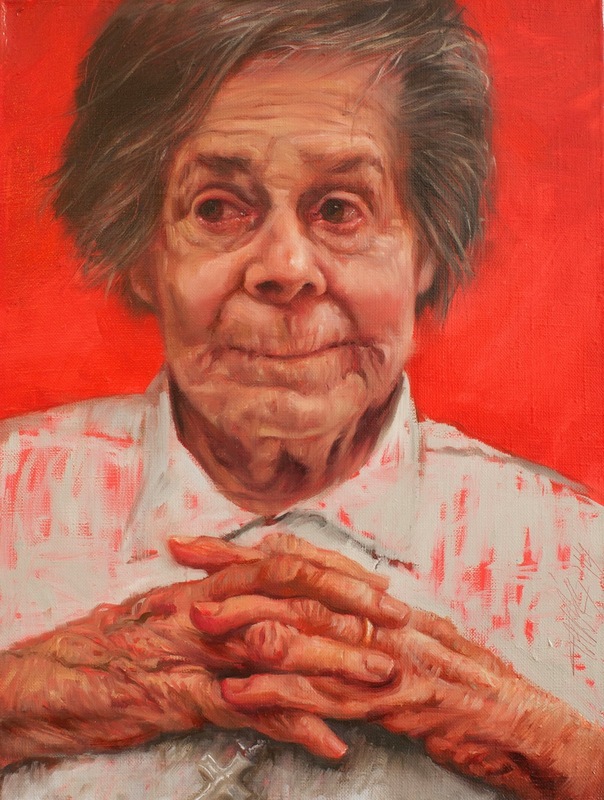 This project (tentatively called NUN) was very much like my Solon Senior Project where I also set up in a weekly spot and painted beautiful old age. The religion aspect is what pushed at my comfort zone. I am not Catholic, or Presbyterian like my mom, or a non-practicing Catholic like my dad, or an agnostic like my husband. I am a Heathen. I unapologetically say I am a Proud Heathen to squelch the hopes of my kind-hearted evangelical friends for a potential rebirthing. I’m not “undecided”, because I truly don't see how I can ever make a “decision” on faith and belief… I just want to keep learning, thinking and doing. a person who does not belong to a widely held religion (esp. one who is not a Christian, Jew, or Muslim) as regarded by those who do. I’m not an atheist, I do believe in God, but it may just be my better self that I’m talking to. But she helps. I believe in love…big time. I also believe in the strength and goodness of humans. I believe in Karma to a certain extent, but don’t think we should do good for the sake of Karma…or Heaven. I think we should be good for goodness sake…to be the change we want to see in this world (that one's from the Dalai Lama). I also believe in the pursuit of our own happiness, but never at the expense of the happiness of others. I’m always in pursuit of the win-win situation myself…and I often find it (this is my take-away message from the much maligned Ayn Rand). But, that will be enough of my sermon. My concern at Notre Dame was that I wanted to paint these beautiful women without being saved or getting into arguments. I’m a pro-choice, pro-birth control, pro-marriage equality, of-course-there's-evolution… kind of gal, and I wanted to respectfully see the inside of an institution (Catholicism) and way of life (being a nun) which, as a Proud Heathen and outside observer I had never really known or understood. Much like a tourist in a foreign country I wanted to learn about the nuns. Actually these women are called sisters. Nuns are cloistered, whereas sisters work in the community…this was one of the first things I learned. The second thing I learned was that very few of them still wear their nun headgear let alone the full habit. I had pictured the paintings as essays in black, white and red, with these delicious weathered faces peeking through. My tourguide for my time at the Health Center was Sr. Annemarie, who, an acomplished pastel artist herself, could not have been more welcoming to me. 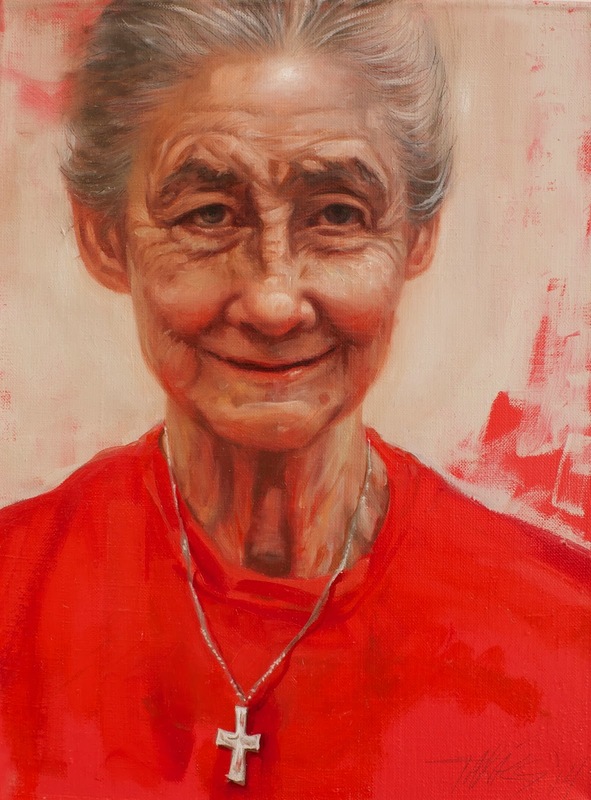 She arranged for all my subjects to pose, made sure I had publicity within the center so I'd have an audience, and generally created a little slice of heaven for me where all I have to do is come and paint an incredibly beautiful, soulful, fascinating and wise woman each week. Sr. Annemarie also took great care to make sure I had at least a few sisters pose for me who do wear the headgear still. Sr. Deborah was my first subject. During our extensive discussions, she did ask me whether I was Catholic. She accepted my heathen status and we talked about good works, being kind to others, service…and she told me how wonderful it was for me to come and bring art, inspiration and beauty into their midst. I told her the honor was all mine…the heathen was making a win-win situation. Truly, they were doing me a huge favor to indulge my selfish art desires and let me paint them. You can see the extensive pictures and progressions on my website, under the heading, NUN. On this blog I’ve shown you a few of the paintings which are well on the way. Not calling them done, but I’m very excited about how they are coming out! Stay tuned to hear about my continued adventures painting the sisters of Notre Dame…and to read about what I learned on my fascinating weekly vacation to the last stop before heaven! Great paintings, Judy! So expressive. Each portrait really seems to capture their personalities. Thank you so much Diane! I look forward to showing with you at SYZYGY too!